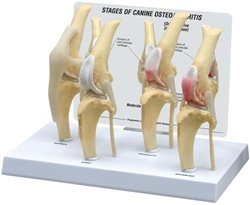 Set of four (4) life-size models illustrate degenerative joint disease (Osteoarthritis). Disease-free (normal) knee also includes additional important structures including ligaments, tendons and patella. The progressive degeneration of the articular surfaces and the development of osteophytes (bone spurs) are demonstrated in the other three models. 1. Made of durable high quality materials. 2. Education card included with model.